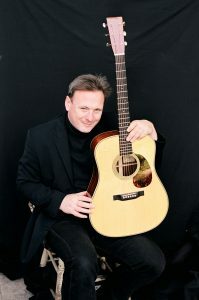 Celebrate St. Patrick’s Day with Tony McManus, a guitar virtuoso whose work both as a guitarist and as a composer has come to represent Celtic music in the guitar world. McManus tours extensively in Europe, the UK, Australia and North America and is a recipient of several festival awards. Registration required. Fee includes gallery admission and parking. McManus is widely considered the top Celtic guitarist in the world and tours extensively in Europe, the UK, Australia and North America. He is invited annually to the Chet Atkins Festival in Nashville, has appeared at Guitar Festivals in Soave and Pescantina, Sarzana and Francacorta Italy; Frankston, Australia; Issoudun and Bordeaux France; Kirkmichael, Scotland; Bath and Kent, England; Bochum and Osnabruck, Germany.